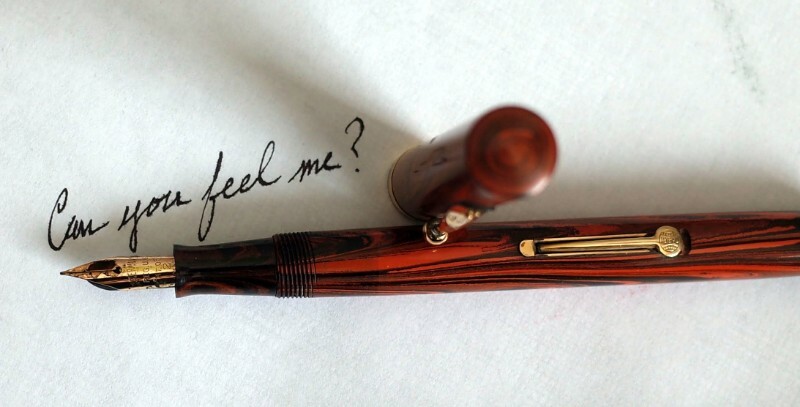 Ideal Fountain Pen: Can You Feel Me? Is there a non-vintage modern equivalent? What is your ideal fountain pen writing experience? One that makes my pen almost a seamless extension of my hand, provides me with the 'right' amount of kinaesthetic feedback that merges with my proprioception, and puts exactly the shapes of the marks I wanted (from each individual pen stroke) onto the page. Pretending that all fountain pen collectors and/or enthusiasts here are like-minded, or at least find some merit in each others' personal preferences, is misguided to say the least. Having a shared or common interest in the acquisition and use of fountain pens does not mean one thinks that any of the following qualities is essential, ideal, superior, or preferable: wet, broad, flex, vintage, piston-fill, transparent, shading, sheeny, and cheap. depends on how flexible that ideal is. There really isn't a modern nib that has the same flex AND snap back, but there are some modern custom nibs that can get the same (or more) flex. This is what is so confounding; the good old days, really were the good OLD days. I wish I could turn back time, not long term to get more vintage flex of the golden age before ballpoint but rather recent time to see if bias is present. If I started with vintage flex first, would the modern nib/feed of smoother glass-like experience be my ideal? I would show a picture of a Sailor 21K (M) KOP or Pilot #30 Custom Urushi as the (i)deal and sing the praises of modern high tech advancements. These vintage daily writers are/were really lifetime writers; like I'll be dead before these 100 yr pens stop putting out. I couldn't care less about flex. Right now I couldn't Copperplate my Spencerian out of a ditch. Maybe it is the minute tine jiggle sensations as a prelude to pengasm or having taken the vintage red pill, we are awake and can break free of the Matrix marketing of high tech glossy plastic candy or tree scab covered ubiquity that dominates now. Who's gonna bring us back to the future? I can appreciate the modern perspective.Because sales continue in this niche ever shrinking non-writing market, tooling/material science costs outweight return of investment to an already complacent satisfied public. Who needs the feels when the visual treat and decent nib/feed is enough? Until then, we enjoy what came before. What's wrong with high tech glossy plastic candy? That's EXACTLY what the Parker 51 was marketed as and the consumers of the time ATE IT UP. Some still do. You're welcome to love your vintage pens, but this is a very subjective thing. I've yet to write with a vintage pen that felt *so* much better than other excellent modern pens. In fact, the hands down best pen writing experience I've ever had was an Omas Paragon Arco Brown. The nib on that pen was insane. Like it was smelted from heavenly gold and made to my own exacting specifications just for my hand. Anyway, I figure I must be missing something. Either that, or a bunch of people have some kind of nostalgia sickness that instantly makes vintage "better" in some vague way that can't be measured. Lots and lots of comments on this forum talk about how vintage is just "better", but I very rarely see a cohesive argument about how or why (objective qualities) vintage is so superior. I plan to give more attention to vintage pens, Pelikans in particular, at the next pen show in an effort to figure this out...but for now, I quite enjoy my glossy plastic candy. And you can keep your flex -- I have a nice stub nib that gives me consistent, gorgeous line variation with zero pressure and pressing down on the nib to get the desired result. I don't know... I'll let you know when I find it. With thanks to my Mom & Dad; who taught me to run free, but not run wild. Please pray the Rosary daily. Thank You, St. Jude, for favors granted. Grab life with both arms and give it a bear hug every day! I've never tried pens that old, so can't comment on flex and such, but I love it when I can write on a micro pillow of ink and get a beautiful ink colour, which also depends on the paper. Even a common Lamy Vista can produce this effect with Équinoxe 6. The "good old times" were certainly old but mostly not so good in my opinion. A lot seems to be nostalgia or simply personal preference. Answer to the first question: No. Modern nibs are different because they are made for modern average customers. If you like the feel of a vintage nib, the straightforward solution is to buy and use a vintage pen. Answer to your second question: There is non. The right pen depends on my mood, the occasion, the paper, the ink, and the phase of the moon. There are countless fantastic pens and I have a fairly significant number of them. I enjoy all of them, each at its time, vintage or modern. And my preferred writers are not in your list, vintage Osmia, Kaweco, Pelican as well as modern OMAS and S.T. Dupont. I kinda have to go along with Omassimo's opinion myself... with the exception of the venerable Parker 51/61/45 Trilogy, (and the Aurora 88P), my luck with other vintage pens hasn't been the greatest, either. My preferences for modern pens include, (but are not limited to): Parker Duofold & Sonnet; Pelikan M600/800; Platinum Century/President; Pilot Custom 74/91; Sheaffer Prelude and almost anything from Lamy or Aurora. For budget pens, I'll go with the Faber-Castell Grip and the Pilot Explorer. HTH in some small way. Be well and enjoy life. Edited by ParkerDuofold, 17 March 2019 - 19:33. I find it interesting, almost peculiar, that this sort of discussion — by the O.P. 's design or subsequent participants' predilections, I'm not sure which — often either veers into vocal nostalgia and/or evangelism for a narrow subset of the tools one could use (which then potentially elicits strongly felt disagreement from some other readers), or become an exercise to establish logical equivalence between tool and experience, as in, "What is your ideal fountain pen writing experience?" gets reinterpreted as, "What is your ideal fountain pen?" If you ask me about my (or 'the') ideal knife-fighting — or if it's more to your tastes, knife-wielding experience in the kitchen, say, slicing sashimi — experience, the knife itself would not be the focus of my thoughts, but what I do with it: my intent for using it in the first place, served by the sequence of manoeuvres I choose, getting into a flow state (as described by Mihaly Csikszentmihalyi) in its execution, with the successful outcome envisioned. I cannot expect to be able to pull that off with my 'favourite' knife every time; success on one occasion in achieving that 'ideal experience', in which that particular knife was an enabler, is no guarantee that I'd be able to do it next time in similar or different circumstances. On the other hand, if you were to hand me someone else's 'favourite' knife of a type, weight and balance to which I'm not attuned, it could mean having to learn some new techniques and hundreds of hours of practice, until it could also be an enabler to another ideal experience. I think some others would describe that as meditation-in-motion. The ideal experience need not even be the end-goal of a quest; it could also be something you did, and immediately afterwards thought to yourself, "Wow! I didn't really think it'd work out so well, and feel so good and effortless." Do the same thing again with the same tool, a few minutes later in the same session, and it may not possibly deliver a comparable ideal experience, but that failure cannot be blamed on the limitations of the tool. Just as the O.P. has subsequently stated for his/her case, I also don't personally care for 'flex' in writing with fountain pens. If I'm focusing hard on producing swells and shades with my downstrokes or wide curved strokes, then at my level of skill at drawing the letters it'll definitely not feel effortless and I certainly will not achieve a flow state. I also don't think highly or favourably of vintage pens at all — with no intended slight on vintage pen collectors and aficionados — and won't buy one with my own money, but I also wouldn't categorically state that it is impossible for a vintage pen (with a 'vintage flex' nib) to induce a flow state when I'm writing; it'd just take lots of dedication and practice, and many less-than-ideal experiences, before I arrive at one 'ideal writing experience' one day, and there is no reason to expect that particular experience to be superior to previous 'ideal writing experiences' enabled by hard and shiny modern fountain pens. Edited by A Smug Dill, 18 March 2019 - 23:51. Mine is any Pelikan. Wonderful wet nibs, great weight and feel, and big ink capacity. Edited by WLSpec, 18 March 2019 - 23:12. I'll pass on having to deal with a sac, thanks. Give me a piston, vac or c/c any day. Another thing about vintage nibs - everyone raves about them and I've no doubt a vintage Waterman flex is sublime, but nobody seems to ever point out that vintage nibs have also been written with for decades and it's possible that "breaking in" may add to the overall feel. I wonder what, say, the modern Aurora flex will feel like in 40 years of writing... I can already tell my Pilot Falcon has loosened up some and that's with a limited amount of use because I rotate my pens unlike a vintage user back in the day. Just a thought. I've owned several different Waterman Ideals from the early 20th century, a couple of Parker Vacs, 2 Wahl Eversharp vintage pens, a few Esterbrook, and a few Sheaffer Balance, so you could say I've had my fair bit of experience with vintage pens. Honestly, I hardly ever used the flex feature of any nib. It just doesn't suit my regular cursive handwriting. So that feature is meaningless to me. Here are a few other observations as to why I will never go back to vintage. 1. I think most vintage pens are ok, but the hype based on nostalgia plays them out to be something greater than they are. There is a reason why hard rubber is not utilized on top pens anymore. Hard rubber oxidizes, sometimes at an alarming rate, and while you can treat it the pen will always be prone to oxidizing again. Second, rubber sacks are a pain to deal with when they fail, and you never know how much ink the pen really has (running out of ink sometimes at inconvenient moments.) Also, some of the more fragile plastics used in the 1930's and 1940's are prone to shrinkage, discoloration, etc. A modern pen from a high end manufacturer like Sailor, Pelikan, Pilot, Aurora, etc., is simply better than vintage. The plastics are more stable, most have ink windows or ways to easily determine ink levels, the nibs are comparable to vintage non-flex nibs, and modern materials are less likely to fail in the way vintage materials will. 2. Modern filling systems are more convenient. While I dislike CC fillers, they are super fast to refill and most importantly the process is not messy. Modern piston filler systems (my preference) and even modern vacs are sturdy and reliable, and you don't have to deal with the drawbacks of vintage piston fillers or vac fillers with cork seals that might have gone bad and are ready to spill ink all over your pocket or carpet, or leave you unable to refill the pen when you need it. And let's not even get started on "safety pens." Those old safety pens are just waiting for one unguarded moment of carelessness on your part to give you, your possessions, or your dog sleeping by your feet an ink bath. Personally my ideal pen these days is a Pelikan M200/400, M600, or M800 (I love them all). Aurora Optimas are also great pens, and the Pilot Custom 823 also ranks high in my book. I've also tried the Lamy 2000, and while not my personal favorite in the style department, it is also a fantastic pen which I would not mind using on any occasion. I don't have a 52, but I do have a 52V. I like it, but I don't think I've come across a modern pen that feels the same. The closest might be a Snorkel with an FF3 flexible nib... but it's pretty old itself . It's not as flexible, but the tipping feels similar. Edited by Tweel, 19 March 2019 - 21:22. * * * "Don't neglect to write me several times from different places when you may." hI've owned several different Waterman Ideals from the early 20th century, a couple of Parker Vacs, 2 Wahl Eversharp vintage pens, a few Esterbrook, and a few Sheaffer Balance, so you could say I've had my fair bit of experience with vintage pens. Honestly, I hardly ever used the flex feature of any nib. It just doesn't suit my regular cursive handwriting. So that feature is meaningless to me. Here are a few other observations as to why I will never go back to vintage. I think you confuse a few things here. It's perfectly fine to prefer the writing experience of a modern pen. And that's what the question was about, the writing experience. Others may prefer how a particular vintage pen writes. The same person might not like the feel of a different vintage pen at all. My opinion is that there is simply no ranking because it's just a matter of personal preference. But you seem to focus mostly on things like material stability or leaking, which first of all wasn't the question of the OP and second is not necessarily a question of vintage vs. modern. People in the 50s did not run about ink stained every day because they were condemned to use a period pen. And the number of posts here asking about various problems with their brand new pens, including leaking, does not shine a good light on current products. It depends on the manufacturer. Top tier HR pens 100 years old stood the test of time surprisingly well. Third tier pens may crumble by now. Are current materials run strong for 100 years? Maybe, maybe not. Furthermore, I think that some current luxury brands do have HR pens in their portfolio. Sac fillers do have disadvantages for sure but they are the quickest and most convenient to fill (maybe except for a cartridge filler). The sac is a consumable and must be replaced every few years. But that's no different to the tires of your car. If they are maintained properly, there is hardly a risk of leaking. At least I had non so far. And guess what, some super expensive current luxury pens fancy a sac filling system. Yes, some of the old thermoplastics were cumbersome. But in my experience most are not and are still in use. In my extended collection of pens from the 1920 to current I see little evidence that top tier vintage materials show more deterioration than current ones. I have Pelikans from the 1930s and 1940s that are in perfect shape, so are Montblancs from the 1940s and 1950s, OMAS from the 1930s and 1940s, Osmias and Kawecos from the 1930s to name just a few from here. My Parkers from the 1940s did not age so well but my Wahl Eversharps and Shaeffers did. By contrast, my first modern Montblanc bought in the late 1990s was a total letdown and broke down leaking repeatedly, despite Montblanc service. Except my Pelikan and Montblanc current pens, none has an ink window. But Pelikan and MB always had ink windows or transparent barrels. Most other vintage piston fillers also fancied ink windows like Osmia, Kaweco, Geha, and countless second and third tier German producers. If you buy a 1950s vintage car, you better make sure that the tires are new. You also may want to check a few other technical details. Same with cork piston seals. A pen that fell dry for decades just needs a replacement and then it's good to go for another few decades of continuous use. But even better, synthetic seals have been introduced in the 1940s, e.g. by Pelikan, and those often are still good to go. My Pelikan 100 from 1942 war time production, probably the first pen to have such a seal, does not leak whatsoever and is in original condition with nothing replaced as far as I can tell. So, long story short, I think it's all about personal preference and the feel of the nib. I forgot to mention the nibs. If you prefer a firm, smooth writer, there is little need to go vintage because there are many excellent contemporary offerings. You still could go vintage in order to save money, though. But if you seek a more responsive, more flexible nib for whatever reason, may it be the freedom to change line variation at will or just the pleasurable feeling of such a nib, then the current productions have little to offer and you might be better off with a vintage pen. Edited by OMASsimo, 19 March 2019 - 22:08. I agree with you all and have much to learn. I've been outed I'm kicking vintage to the curb. No loyalty there. Seriously though, I enjoy all my pens (today's daily carry was all modernish: L2K, Pilot Kakuno and Pilot Fermo). Each has/will make their own delightful experience/history. The reason for the thread was that vintage caught me by flexible surprise. I thought Modern == Supreme. Ageism is rampant. CADly customized personalized 3-D robotically done specs are probably the future, but might as well go point with a ball or Apple pencil! I like @OmegaMountain's thought that age has weight and is relative. If I live long enough, maybe a Pilot Soft Fine will be the new vintage hotness. The next generation, if there is one will be singing the praises and collecting vintage Conids. For me, the nib/feed writing experience has the highest weight in the optimization matrix of pen selection. Each new pen must endure a fierce randori of MMA writing bouts against all comers on the 52g/m3 Tomoe River cage. There is no use for pretty eye candy. Ditch the filling mechs and handcraftedness by retired craftfolk while we're at it. Why would anyone spend hard earned ink sweat for some century old used grandma pen with all the risk of more outlay for future TLC? Watch out grandma Waterman has a deadly 14K frying pan which beat the youngsters soundly. Whoa?! While I'd love to have my above Frankenpen stamped out as a commodity to jump start a revival among the non-pen masses, in truth, vintage charm and nostalgia does have a wabi-sabi place in my heart. It's not coming back. Ephemer-real. Plus the nibmavens/meisters and now well-regarded artisans who have given their decades are slowly too fading. I'd love to see that endure, that culture carried over. As I age in this fast moving time, I'm foolishly finding these narratives quite valuable. Sure pens are mere tools but they have stories behind them and stories before them. I am a mere custodian in their long chain. I also drink out of tea bowls. Let us hope others too will enjoy the delights of fountain pens that we all share. I have to assume that when someone says 'he don't care about flex', he means superflex.........??? .......if he includes semi-flex into his definition...........sigh cubed...........probably hates springy regular flex (Japanese 'soft') also....could be don't like semi-nail either, which can be flexed if one is strong enough....perhaps even twice. I really like the '50-70 German semi-flex piston pens. Got over 40 of them.........28 semi-flex, 16 or so maxi-semi-flex.............and obliques in both flexes. Sitting at the well over here in Germany so didn't have to go out of my way. Semi-flex add flair to my script with out me having to do anything......like Draw a Letter, like if I'm using Superflex. That is one beautiful 52. I have two BCHR 52's one if one looks hard enough is a Frankie (one does have to look hard...and so what it's a wet noodle.). One goes 7 X the other 6 X****. My best superflex nib is a Soennecken. Somewhere I have an loose Ideal nib....it is not superflex and I've had no urge to take apart a working pen to put that nib in it. ***** Read Richard binder's article on metal fatigue. After reading that I stopped maxing my nibs. My 7 X wet noodle is only taken to BB instead of BBB. My 5 X taken to 4 X and so on. When I was a 20 pen noobie, I did a balance test. I'd not expected the brass gutted there for back heavy standard sized MB 234 1/2 Deluxe semi-flex KOB to be #1, #2 was a thin medium-long classic Geha 725 with an gorgeous inlaid nib; semi-flex F. #3 a P-75....nib a semi-nail M (but it was a balance test, not a nib test). and a neck back in the race in 4th place was the 400NN with had taken some two years to beat out the 400 for balance. The 400nn holds a ton of ink. Mine is a maxi-semi-flex OF. In the mean while I must have 15-18 top five balanced and nibbed pens. I will always be missing ripple hard rubber...............but to balance that I do have some nice BCHR, which when I was newer, I never expected to own....in they were way over then's budget. Anticipation is half the thrill. May your grail pen come finally within reach. Edited by Bo Bo Olson, 20 March 2019 - 22:10. German vintage '50-70 semi-flex stubs and those in oblique give the real thing in On Demand line variation. Modern Oblique is a waste of money for a shadow of line variation. Being too lazy to Hunt for affordable vintage oblique pens, lets you 'hunt' for line variation instead of having it. The cheapest lessons are from those who learned expensive lessons. Ignorance is best for learning expensive lessons. My ideal fountain pen writing experience is probably a simple Esterbrook Black Dollar pen with a 2668 nib, effortless, worry free writing, just lets the words flow onto the page. I do like the colored varieties better, but for some reason have yet to have nib and pen part. My ideal fountain pen would be on that writes like the Esterbrook Dollar above in pen made of wood grain ebonite, and is bulb filler. I have this pen too.....so I am good to go. Hoping use it to to get through a good portion of my ink stash in the next year or so! Edited by JakobS, 20 March 2019 - 17:23. Seriously though, I enjoy all my pens... Each has/will make their own delightful experience/history. I agree -- that's why I qualified my own post. Amblin along like I had good sense. I don't think there is a Parker 51/61/45 trilogy. I have used several 61s and several 45s, and they are not on the same plane as the 51. "Don't hurry, don't worry. It's better to be late at the Golden Gate than to arrive in Hell on time." --Sign in a bar and grill, Ormond Beach, Florida, 1960. They took the blue from the skies and the pretty girls' eyes and a touch of Old Glory too . . .
Steps To Restore A Vintage Wahl-Eversharp For A Complete Newbie? Any Tips On How To Restore This Vintage Wahl-Eversharp?